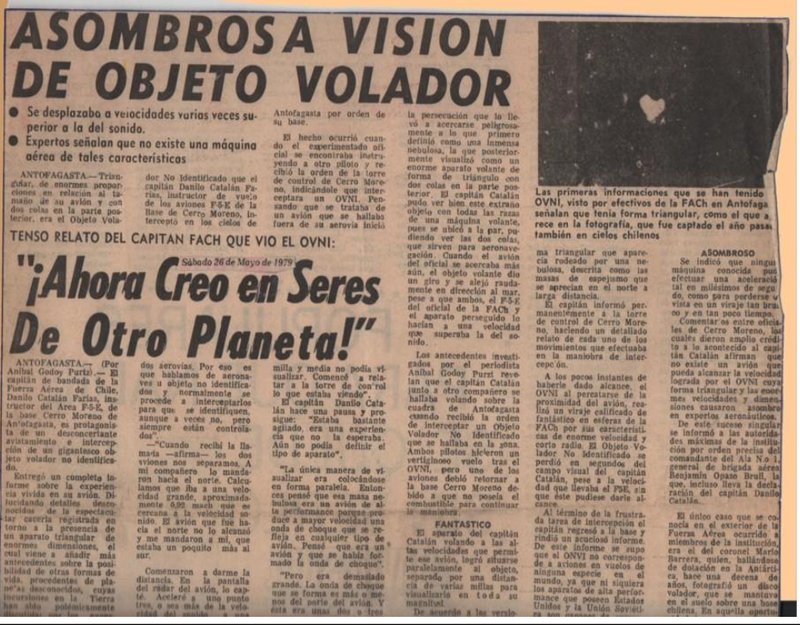 In both instances, aircraft from the Chilean Air Force based at Cerro Moreno scrambled in pursuit of the UFO, whose size was estimated at fifty times that of a fighter-bomber. During its second visit, it was witnessed by thousands of onlookers from San Pedro de Atacama until it hovered above the air base. A flying triangle of a size equivalent to some fifty fighter bombers (an estimated length of three hundred meters) visited the city of Antofagasta during the second half of 1978 and in both instances was pursued by fighters from the Antofagasta Cerro Moreno air facility of the Chilean Air Force, obviously without much success. This is one of the most spectacular events to have taken place in Chile in modern times, and curiously both events are scarcely known, in spite of the fact that it among the best-documented cases, with witnesses and experiencers of the highest solvency one could wish. The first case occurred round the month of October, 1978, and the second in December. Two FaCH pilots were involved in the first and during the second, three pilots sent by an Air Force general. During the second incident, the giant flying triangle was seen from San Pedro de Atacama (on the border with Argentina) until it reached the coast, which means a journey four hundred kilometers in less than five minutes. 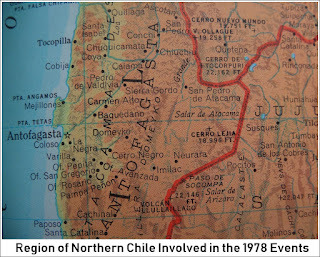 The second case involved hundreds of witnesses who followed the path of the mysterious vessel, which after displaying itself in a broad area of Chile’s Sixth Region, vanished as enigmatically as it arrived. There are no exact dates for either the first or second case. However, both were confirmed by Gen. Benjamin Opazo Brull, Wing Commander 1, based at Cerro Moreno, shortly after the spectacular fighter chases became known. It is possible, however, to place the first of them around October, and its main protagonist was Captain Danilo Catalán Farias, a pilot with eleven years’ experience in fighter aircraft at the time. According to the stories that became known months after the events occurred, it was said that Catalán and another pilot were given orders to scramble their fighters and intercept an enormous object of unknown origin approaching from the Argentinean border toward Antofagasta. Two F5-E fighters took off swiftly to accomplish the mission. Shortly after takeoff, Catalan’s wingman had to return to base due to being low on fuel, while the task ahead promised to be long and without a clearly scheduled return. Danilo Catalán opened his afterburners and placed himself only a few miles from the object, ascertaining that it was triangular and enshrouded in a strange cloudiness. The UFO did not welcome the Chilean flyer’s scrutiny and perhaps in a display of its immense superiority, made an unexpected 90-degree turn, impossible for any terrestrial aircraft, and vanished from the airspace. Captain Catalán, in the measure that the enormous and enigmatic craft drew closer, provided a detailed description of what was going on during the cat-and-mouse game. These details were forwarded immediately to the Air Force Command for two major reasons: one, the case could prove to be extraordinary and have an unexpected outcome, and two, the Air Force Commandant at the time, Gen. Fernando Matthei, had a particular interest in the subject. Catalán’s flight toward the giant triangle was very swift, since the pilot had been ready to take off on a training mission. At that precise moment, the control tower advised him that the radar screens showed an unidentified flying object – a concept involving any aircraft entering national airspace and remaining unidentified until it is indeed identified and requests permission to transit through the air corridors. Catalan’s wingman’s fighter set off to intercept the object but was unable to find it. Low on fuel, it returned to base. Catalán substituted his companion in finding the UFO, gaining altitude until he found it, coming within two miles of the object. At that altitude, they were aware of what they were getting involved with. The pilot was able to see a massive structure, larger than any known airplane. The weather was clear with excellent visibility. The shock waves produced between two aircraft as they approach each other were tremendous, which gave an idea of the UFO’s size. Finding itself harried, the object made the turn discussed earlier and disappeared. All of this was picked up and ascertained by the radar at the Cerro Moreno control tower. The disappearance of the flying triangle did not mean the matter was over…at least not for the UFOs. The UFO returned in mid-December, two months after Captain Danilo Catalán’s failed pursuit. This time it was accompanied by tremendous expectation as it made its way over the heads of thousands of onlookers in a wide area of the Chile’s Second Region. 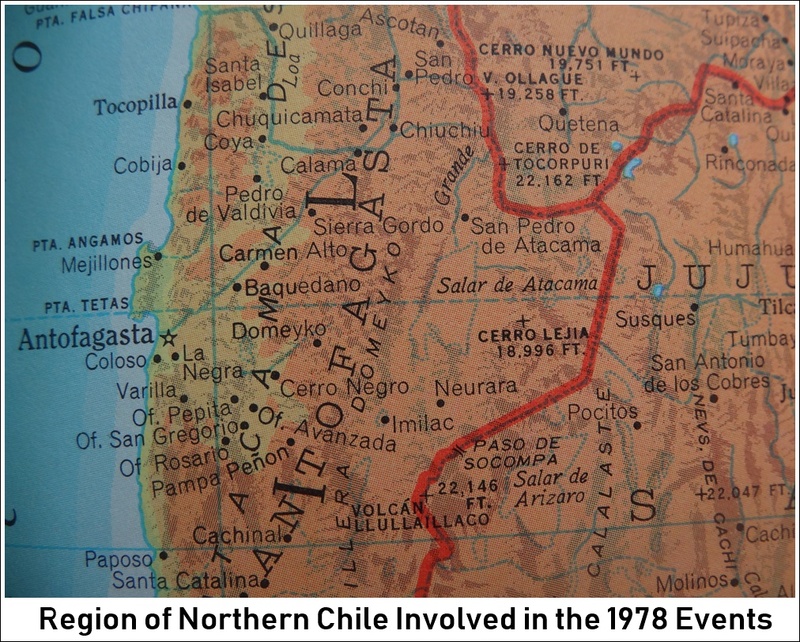 The first to become aware of the UFOs presence were the Carabineros (state police) of San Pedro de Atacama, a small Chilean community close to the border with Argentina and Bolivia. The policemen radioed their superiors in Antofagasta, some 400 kilometers to the west, that an enormous object with blinding lights was headed for the coast. 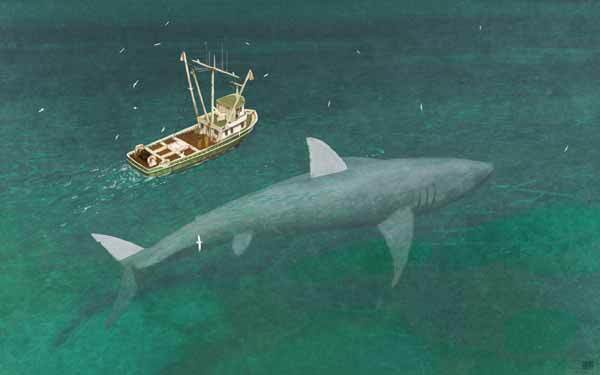 Students of the Instituto Superior de Carabineros who were surveying the area had a similar sighting. The object was later seen by thousands of residents of the city of Calama and picked up by the control tower at the city’s airport. “The time was approximately twenty hours on a day in December 1978 when we were given the order to take off. Calama had advised us of a large object at some 10,000 feet. When I was in flight, I was told to head to the vicinity of Maria Elena (a major nitrate field), where it had been seen last. I flew there, and it was still daylight. It was completely clear, cloudless and there was still some darkness in the upper elevations. “We teamed up with the fighter behind me at 20,000 feet to insure that we would be above whatever we were going to encounter. We headed for the area and found nothing at all. After making a few turns over Maria Elena and Pedro de Valdivia (another nitrate field), we found a third fighter engaged in a similar task, that is to say, finding an object allegedly at ten thousand feet. “In order to confirm this, I looked first to the east, where it should have been darker and stars should have been visible, but there were none. It was toward the zenith, and even toward the West, that we found the large UFO. I asked Lt. José Fernandez Marin in the other plane if he could see something shining to our left and replied affirmatively, adding that he was heading it its direction. There was a ten mile or more separation between us. Lt. Fernandez had fallen behind and I had lost him from sight during one of the turns, and he was approaching at high speed. He employed the excess velocity to make direct run at the UFO. “I asked him to read out his altitude. I didn’t see it, but I began my own turn and ascended toward the UFO. Since we did not have it in sight and were heading toward a common point, we had to be careful. I told the control tower that we had seen the UFO, we were heading for it and that I estimated it to be at some 70,000 feet. I later thought that I’d exaggerated the altitude. I repeat: I estimate some 70,000 feet, as Fernández read out the distance. He ascended to 30,000 and I flew at 25,000, keeping five thousand feet between us. At the moment that Fernandez’s aircraft began condensing, we were already at some thirty five or thirty eight thousand feet. “By design, the fighter cannot go beyond 50,000 feet. I then told him to advise me when he’d exceeded that mark. I reached 48,000 and Fernández hit 53,000, and the UFO was still overhead. 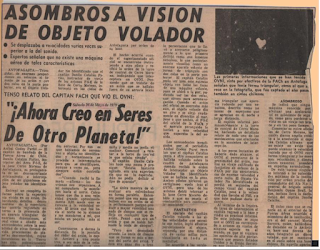 When we were around thirty five thousand feet, the object began changing its configuration from round to triangular, and the ratio I managed to estimate been the UFO and Fernandez’s aircraft was one to fifty, approximately, and I can say this, because in order for the UFO to be visible from as far away as Tocopila, Cerro Moreno, Calama and other points from which it could be seen simultaneously meant that it size must be tremendous. The Carabineros from Monturaqui and San Pedro de Atacama were the first to see it and they notified the other plane (the one flown by Captain Lira). “We went out to look. All of us present were pilots. We looked at the runway and saw an object looking like a very bright balloon at an elevation we placed at between six and seven thousand feet. Finally, we decided to go up in a plane and see what was going on. Five minutes had elapsed from the moment that Carabineros gave notice from San Pedro de Atacama until the UFO was parked over our base. However, we have Commander Prat Corona’s opinion. 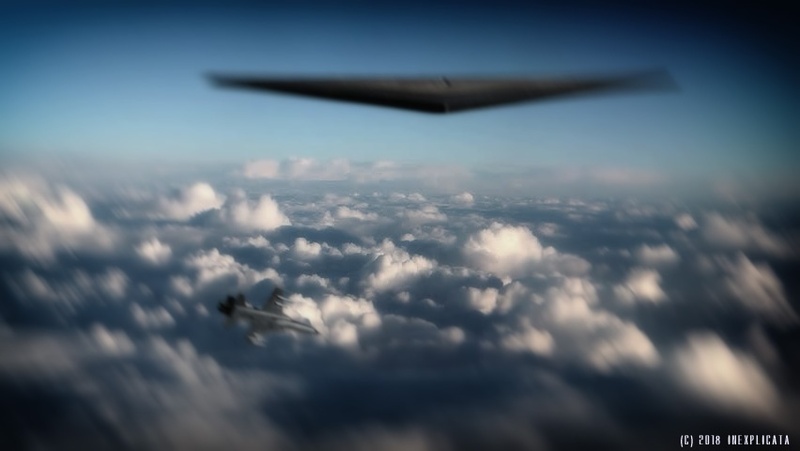 Having his wingman’s aircraft in view along with the UFO, he was able to deduce that the flying triangle was 50 times larger than the F5-E fighter-bomber. In other words, the mysterious object must have been 300 meters long. UFOs of this type are seldom seen around the world. More than an aircraft, they have been compared to floating cities. The people of Antofagasta had the extraordinary privilege of seeing such a unique specimen of extraterrestrial fauna twice. Publicado por Terra Incognita en 3:31 p. m.